Today, the Episcopal Diocese of Hawai‘i consists of 37 worshipping communities on five islands. 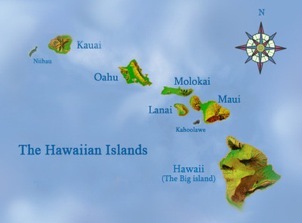 About half of these are on the island of O‘ahu, where Honolulu, the capital of Hawai‘i, is located, while the others are distributed among Kaua‘i, Maui, Moloka‘i, and Hawai‘i (“the Big Island”). We are on islands in the middle of the Pacific living in completely multicultural surroundings. Some congregations were founded to serve a particular ethnic group, but have since evolved to include a mix of people of, perhaps, Japanese, Korean, Chinese, Samoan, Hawaiian, Filipino, Mexican, and European descent. Though small and rural with miles of open spaces, we also reflect urban life. With over 115 clergy in the Diocese, 30+ are canonically resident clergy who live/serve outside the Hawaiian Islands (including Guam and Samoa). The Right Reverend Robert L. Fitzpatrick became Diocesan Bishop on March 10, 2007, after serving as the Bishop’s Canon since 2000. He is the fifth Bishop of the Episocpal Diocese of Hawaii and has oversight of the Episcopal Churches in Micronesia (Guam and Saipan). Bishop Fitzpatrick emphasizes that the congregations of the Diocese must cooperate with one another to accomplish the ministry and mission to which God calls us. The Bishop’s staff consists of five additional full-time employees and and one part-time employee. Please visit the "Bishop's Office" page for contact information.